Catherine Berlin is an investigator for the Financial Services Authority, working as part of a task force whose remit is to clamp down on London’s illegal loan shark businesses. Working with an informant she knows only as ‘Juliet Bravo’, Berlin continues an investigation into East End shark Archie Doyle despite the fact that her superiors have closed the case and warned her off. Berlin’s life is complicated by the fact that, aged 55, she’s a registered drug addict, and receives daily doses of pharmaceutical heroin from one of the few doctors left in Britain with a license to prescribe it. When both her informant and her doctor are brutally murdered, Berlin finds herself in the middle of two investigations in which police consider her as a major player. With seven days before her stash of heroin runs out – and any clarity of mind that the drug brings with it – Berlin is up against the clock not only to find her next fix, but also to find the killer and clear her own name. Hauxwell’s first novel takes no time in getting to the point. As the book opens, we find Berlin standing at the edge of the Limehouse Basin, watching her informant floating in the water below. We quickly get a feel for the character, and the people she is dealing with – the talkative Dempster, the quiet Thompson and the almost farcically stupid Flint. Berlin is a character that is difficult to like, but as the ever-luckless antihero, we find ourselves rooting for her nonetheless, as she moves from one bad day to the next. She’s a woman on the edge, impending withdrawal driving her as hard as the need to know, to find out the truth. And behind it all a black sense of humour that usually serves to rub people the wrong way, but which makes her more human in the eye of the reader. The plot is complex and involved, but not so much that it will turn the casual reader off. Characters are interconnected in myriad unexpected ways, and a web of relationships, and of cause and effect, forms as the novel progresses. Despite the complexity, and multiple strands, the author manages to maintain complete control – no obvious plot holes or dangling story arcs here; Hauxwell weaves the threads into such an accomplished and coherent whole that it’s easy forget that this is the work of a first-time novelist. Characterisation is the only area where the book doesn’t quite reach its full potential. While Berlin comes to us fully formed, some of the other characters can be a bit lacking in original personality, cardboard cut-outs from a thousand gritty dramas set in and around the East End of London: the wheeler-dealing gangster; the bent cop; a handful of others. What’s interesting, and what makes the novel stand out from many of those others, is the ambiguity built in to all of these people. There is no black and white here, but varying shades of grey that serve Hauxwell’s purpose well: these are all ordinary people acting under extraordinary circumstances; no-one, least of all the reader, can anticipate how these people will react in these situations, and as a result they sometimes do so in unexpected ways, with surprising consequences. Dark and gritty, Hauxwell’s debut combines wonderful sense of place (and cold), interesting (if somewhat stereotypical) characters, and a complex and moreish plot into the perfect example of what was once called (and may still be, though it’s not a phrase I’ve seen in a few years) “Brit noir”. There’s enough humour to keep it from being dreary and depressing, and enough action to keep it moving at a good pace. Catherine Berlin, demons included, makes for a surprising and bold choice of central character, but ultimately has the charisma to carry it off and leave the reader hoping for her return in future instalments. Hauxwell is an author who evidently takes great delight in putting her characters through the mill and, on several occasions throughout the book, we find ourselves wondering “what can she possibly throw at this poor woman next?”. 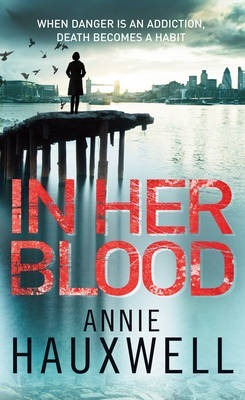 In Her Blood is a fine crime novel, and a wonderful debut from a writer who looks set to give the cream of British crime fiction a run for their money. The ticking clock of a heroine addict needing her next fix is intense. I was very impressed by the author’s use of legitimacy to diminish the stigma. I can forgive the characterization seeing as how well the story plays out. I love the pick of location. I’m looking forward to a gritty novel set in London with someone other than the legendary Sherlock Holmes.